Pinard Waste Systems is proud to be the largest, independently owned, solid waste collection and disposal company in New Hampshire. Our success is based on personalized, dependable, responsive service, whether you own a home, a business or you operate a municipality. That’s why Pinard was named the best waste removal company by the New Hampshire Business Review’s Best of Business Award for the past four years in a row and seven times in the last eight years. Founded by Mr. & Mrs. E. Charles Pinard, Pinard Waste Systems, Inc. got its start in 1963 as a one-truck operation serving Manchester’s Historic Mill Yard District. 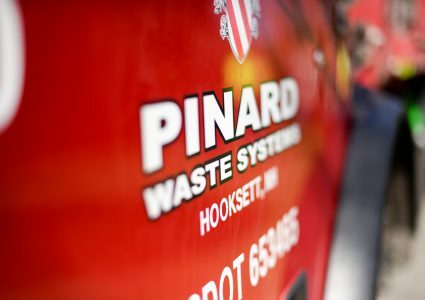 Today, Pinard serves thousands of customers throughout Central and Southeastern New Hampshire and Northeastern Massachusetts, offering an array of waste and recycling options to a broad customer base. At Pinard Waste Systems we’ve made it our business to serve your business with innovative waste and recycling services. Whether you are a new or existing customer, take advantage of our waste analysis to find out if your waste and recycling program can be improved. Please call our office at (603) 623-7933 or use our online form to request an analysis. Pinard’s company logo is a replica of the Pinard family crest, which signifies the commitment to excellence we maintain on behalf of the Pinard family. As a full-service company, Pinard Waste Systems offers solutions for commercial, industrial, residential, and municipal needs. Whether you need curbside collection, a dumpster for your business or home, a roll-off container for a construction job, a compactor, or a comprehensive recycling program, contact us and experience the difference a locally-owned, NH-based company can make.